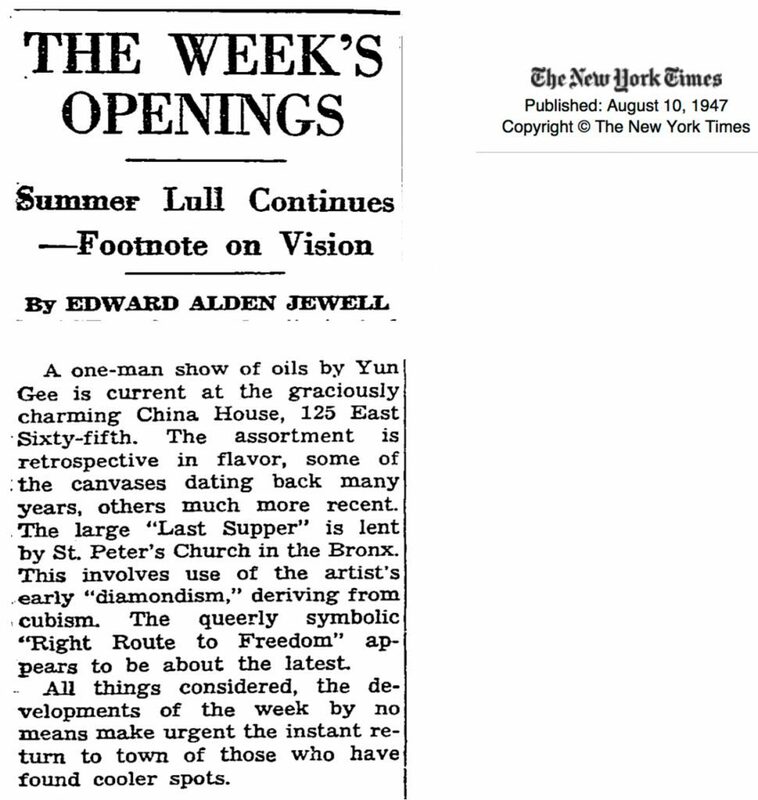 “Art will save our country!” so spoke the famous Dr. Sun Yat-sen in China. 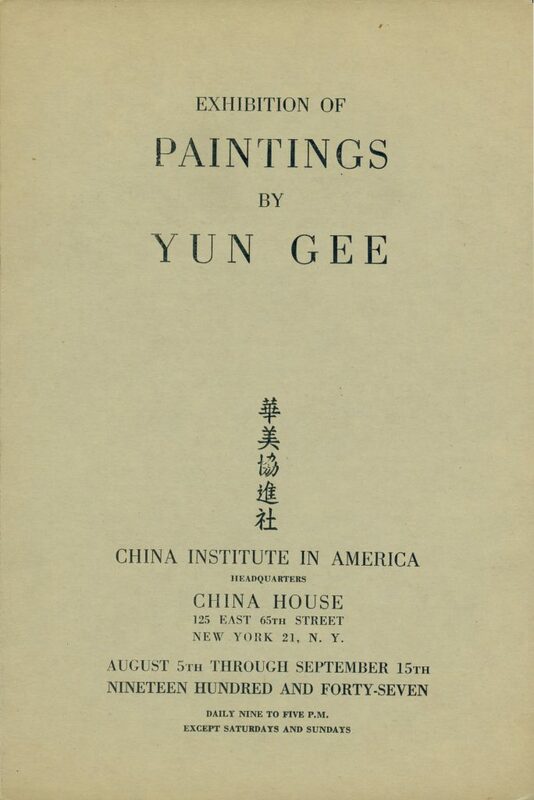 In America, we are proud to present a Chinese-American idealist, YUN GEE, who with brush in hand goes one step further. It is his belief and conviction that, though the medium of art, we can find the Symbol of the New World – that new world of peace and security we are all hoping and striving for. 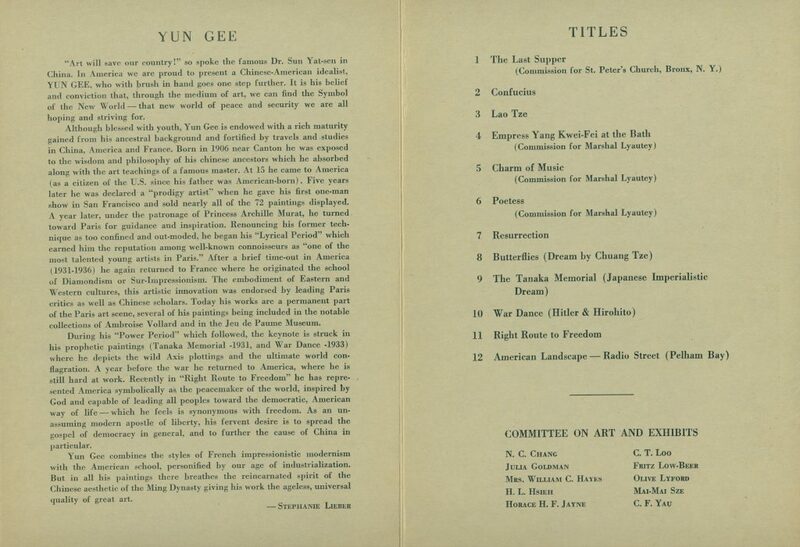 Although blessed with youth, Yun Gee is endowed with a rich maturity gained from his ancestral background and fortified by travels and studies in China, America and France. 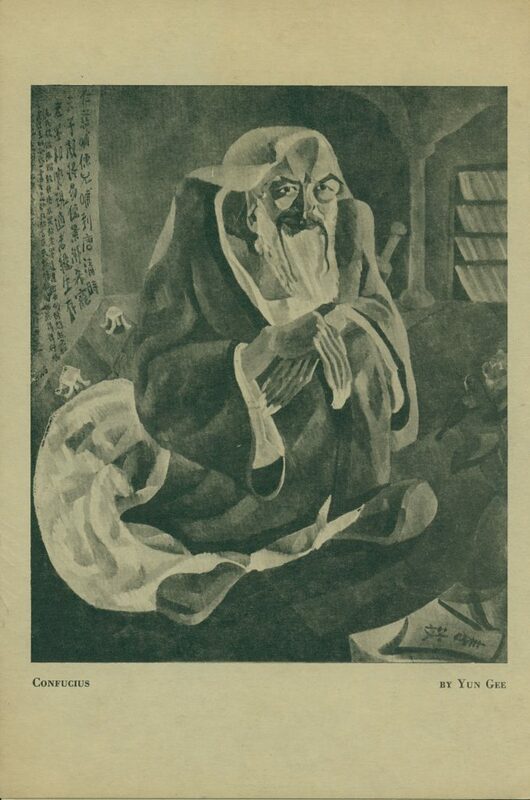 Born in 1906 near Canton he was exposed to the wisdom and philosophy of his Chinese ancestors which he absorbed along with the art teachings of a famous master. At 15 he came to America (as a citizen of the U.S. since was father was American-born). 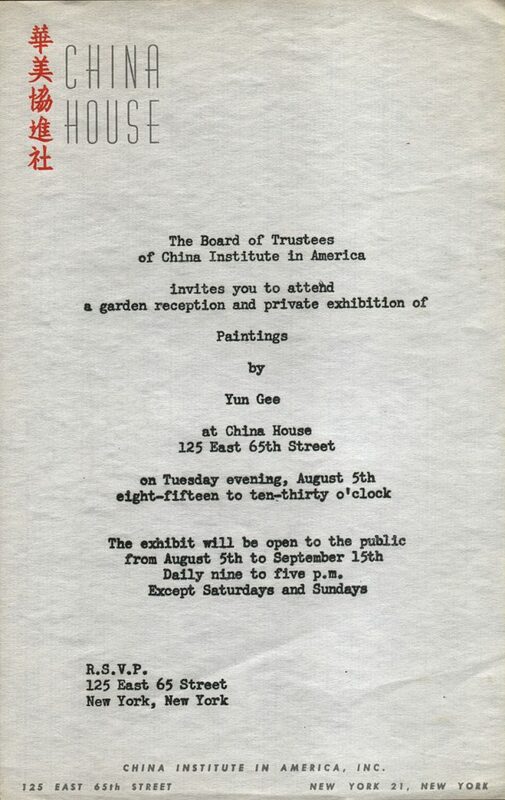 Five years later he was declared a “prodigy artist” when he gave his first one-man show in San Francisco and sold nearly all of the 72 paintings displayed. A year later, under the patronage of Princess Achille Murat, he turned toward Paris for guidance and inspiration. Renouncing his former technique as too confined and out-moded, he began his “Lyrical Period” which earned him the reputation among well-known connoisseurs as “one of the most talented young artists in Paris.” After a brief time-out in America (1931-1936) he again returned to France where he originated the School of Diamondism or Sur-Impressionism. The embodiment of Eastern and Western cultures, this artistic innovation was endorsed by leading Paris critics as well as Chinese scholars. Today his works are a permanent part of the Paris art scene, several of his paintings being included in the notable collections of Ambroise Vollard and in the Jeu de Paume Museum. During his “Power Period,” which followed, the keynote is struck in his prophetic paintings (Tanaka Memorial – 1931, and War Dance – 1933) where he depicts the wild Axis plottings and the ultimate world conflagration. A year before the war, he returned to America, where he is still hard at work. Recently, in Right Route to Freedom, he has represented America symbolically as the peacemaker of the world, inspired by God and capable of leading all peoples toward the democratic, American way of life – which he feels is synonymous with freedom. As an unassuming modern apostle of liberty, his fervent desire is to spread the gospel of democracy in general, and to further the cause of China in particular. Yun Gee combines the styles of French impressionistic modernism with the American school, personified by our age of industrialization. But in all his paintings there breathes the reincarnated spirit of the Chinese aesthetic of the Ming Dynasty, giving his work the ageless, universal quality of great art.